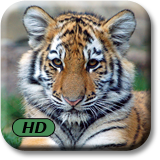 Amazing tiger wallpapers for your device home and lock screen! Admire 35 photos of adult, juvenile and tiger cubs playing, growling, yawning, and snoozing. 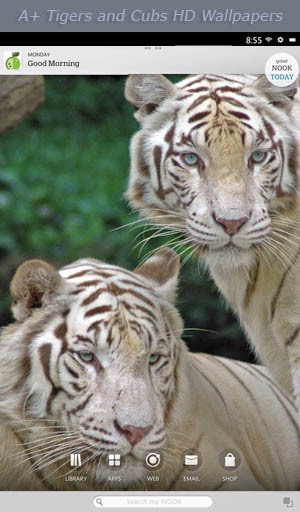 Marvel at these rare white and golden Bengal, Siberian, Sumatran, and South China tigers! 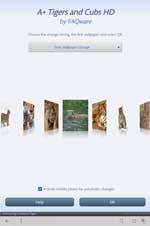 Each high resolution photo is optimized specifically for your device's screen with captions. Photos change automatically each week, day, hour, or stay on a single photo. Change tiger photos any time with a swipe up or down! Have fun personalizing your device. And check out our popular "A+ Animal Babies" wallpapers too! Now tap the A+ Tigers and Cubs HD choice.